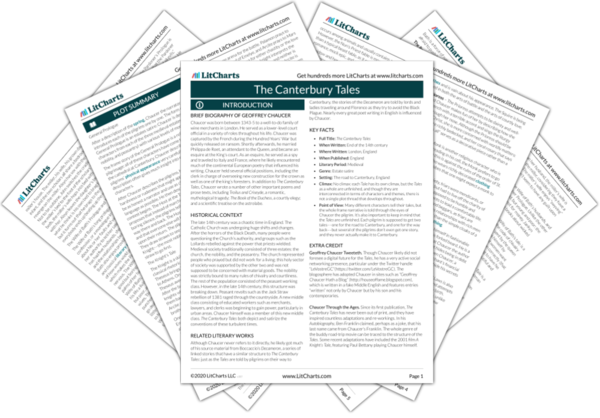 Instant downloads of all 945 LitChart PDFs (including The Canterbury Tales). 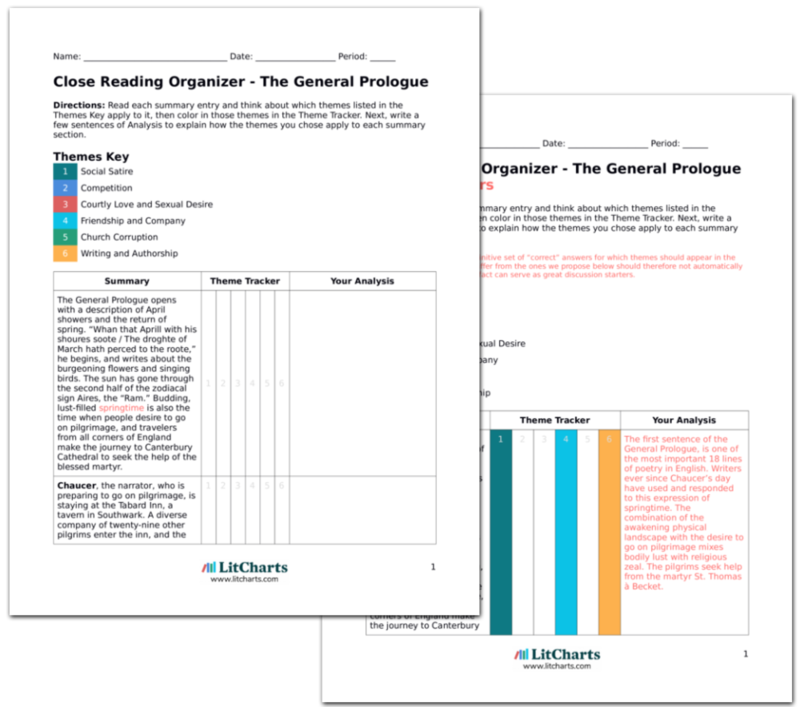 LitCharts assigns a color and icon to each theme in The Canterbury Tales, which you can use to track the themes throughout the work. Chaucer is considered to be the father of English poetry. Even though the premise of the Tales is that they unfold organically throughout the course of the pilgrimage to Canterbury, Chaucer is highly conscious of the fact that he is conducting a literary project with readers as well as listeners. When the Miller introduces his tale, for example, he says that if the reader doesn’t like it, he should simply “turn over the leef and chese another tale” – in other words, turn the page and read another story. Chaucer himself appears as one of the pilgrims. He depicts himself as a bumbling, clumsy, foolish sort, and the two tales he tells are ironically awful, given that we know he is the mastermind behind this whole enterprise. The concept of a framing narrative that surrounds a group of tales is itself is a common literary convention, seen, for example, in The Thousand and One Arabian Nights. Chaucer most likely based his frame narrative on Boccaccio’s Decameron, in which ten ladies and gentlemen, traveling around the Italian countryside to avoid the plague, tell each other stories. In this tale-telling competition, the pilgrims are very interested in what makes for good and bad literature. Are the best tales the ones that give the best moral lessons, or the ones that provide the most entertainment for the company? 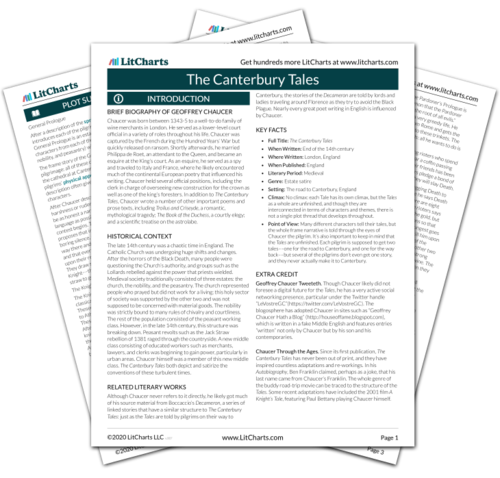 The Canterbury Tales contain a vast array of subjects and literary genres, from noble depictions of courtly love to bawdy jokes to beast fables to stories of saints’ lives. Almost all the pilgrims introduce themselves and their tales through a prologue, in which they typically explain who they are and why they are going to tell their tale. The pilgrims have several different theories about what makes a good story and what it means to have the authority to tell it. The Wife of Bath claims that authority comes through experience, saying she is qualified to tell a tale of love and marriage because she has been married five times and using her own interpretations of Scripture as evidence. The Pardoner unapologetically describes how he cons foolish men out of money by selling them false religious relics. He rejects a monastic life, declaring that he lives for greed rather than celestial love. But even though he himself is vicious, he says, he knows how to tell a moral tell with the lesson that greed is the root of all evils. Chaucer uses a huge variety of styles and forms in the tales. Each pilgrim has a distinct voice. The Knight uses genteel, formal language, while the Miller and Reeve speak in coarse, rude double entendres. Although the majority of The Canterbury Tales are in rhymed couplets of iambic pentameter, some of them use different verse forms. The Prioress tells her story of a pure-hearted Christian boy in rime royal, which is a rhyming form in seven-line stanzas. Chaucer’s Tale of Sir Thopas is told in comic doggerel with a thumping, irregular rhythm. The ThemeTracker below shows where, and to what degree, the theme of Writing and Authorship appears in each section of The Canterbury Tales. Click or tap on any chapter to read its Summary & Analysis. Below you will find the important quotes in The Canterbury Tales related to the theme of Writing and Authorship. That hem hath holpen whan that they they were seeke. For Frenssh of Parys was to hir unknowe. This is to seyn, a monk out of his cloystre. But thilke text heeld he nat worth an oyster. For May wole have no slagardie anyght. And maketh it out of his slep to sterte. That gretter was there noon under the sonne. What with his wysdom and his chilvalrie. Greet was th’effect, and heigh was his entente. In certeyn boundes, that they may nat flee. With which I wol now quite the Knyghes tale. And eek moralitee and hoolynesse. Blameth nat me if that ye chese amys. The Miller is a cherl, ye know wel this. As greet as it had been a thonder-dent. Peraventure in scorn, for I am oon. And, by youre leve, I shal him quite anoon. Of Aleyn and of John, that bette hym weel. His wyf is swyved, and his doghter als. Low, swich it is a millere to be fals! Were in this world, is right ynough for me. That gentil text kan I wel understonde. That in our fyr he fil bakward adoun. And for to been in maistrie hym above. God sende hem soon verray pestilence! I preche of no thing but for coveityse. His name was sire Thopas. Taketh the fruyt, and lat the chaf be stile. Raphel, Adrienne. "The Canterbury Tales Themes: Writing and Authorship." LitCharts. LitCharts LLC, 8 Nov 2013. Web. 23 Apr 2019. Raphel, Adrienne. "The Canterbury Tales Themes: Writing and Authorship." LitCharts LLC, November 8, 2013. Retrieved April 23, 2019. https://www.litcharts.com/lit/the-canterbury-tales/themes/writing-and-authorship.